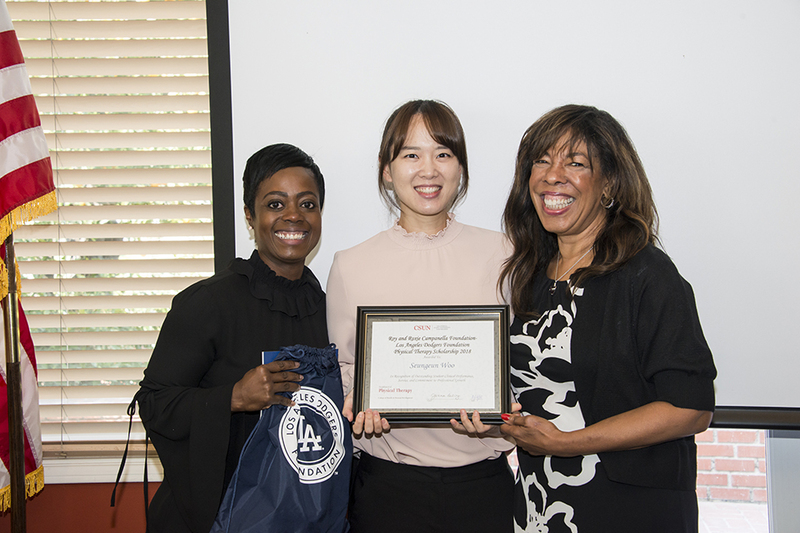 The Dodgers and Campanella Foundations help provide financial aid to California State University, Northridge physical therapy students seeking their doctorate. On Feb. 9, the two foundations welcomed their largest cohort yet, with 25 scholarship recipients. Photo by David J. Hawkins. Seungeun Woo moved to the United States when she was 20 years old. She is now in her third year of CSUN’s DPT program and will be receiving her doctorate in May. Photo by David J. Hawkins. Nelly Geronimo is the first in her family to pursue an advanced degree. Winning the 2018 Roy and Roxie Campanella Scholarship validated her hard work, she said. Photo by David J. Hawkins. Antonio Hanlin Feng is the only international student in CSUN's DPT program, meaning he pays more tuition than his classmates. 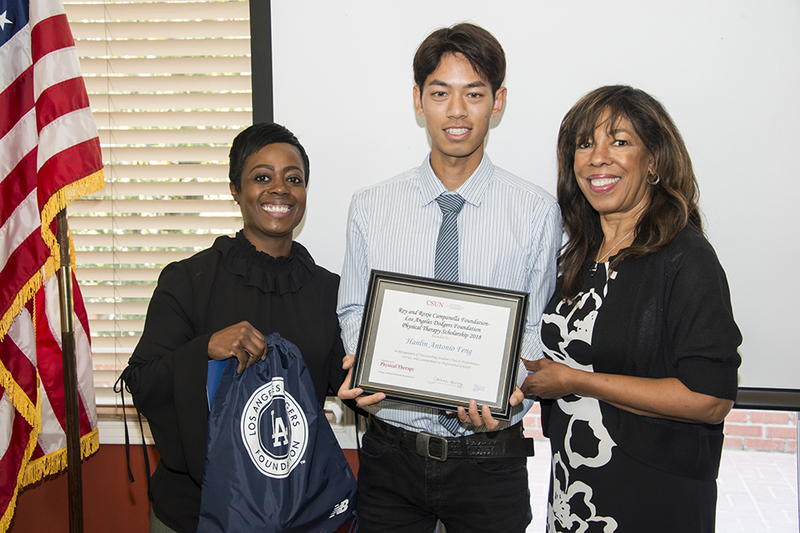 Feng said receiving this scholarship encouraged him to continue his education in the United States. Photo by David J. Hawkins. First-generation student Nataly Ochoa wants to be a physical therapist to overcome some of the barriers that underrepresented communities face when seeking treatment. Photo by David J. Hawkins. When Roy Campanella became the first catcher of color in Major League Baseball history in 1948, he had no idea how far his impact would spread. He couldn’t know that he was paving the way for future baseball greats like Giancarlo Stanton, Jose Altuve and Carlos Correa, who were among the 27 minority players who participated in the 2017 All-Star Game. Ten years after joining the majors, the future Hall of Famer was injured in a car accident that left him paralyzed from the neck down. His perseverance, work ethic and dedication to physical therapy and his community led to The New York Times calling him “a universal symbol of courage” and “an inspiration” for people living with disabilities. 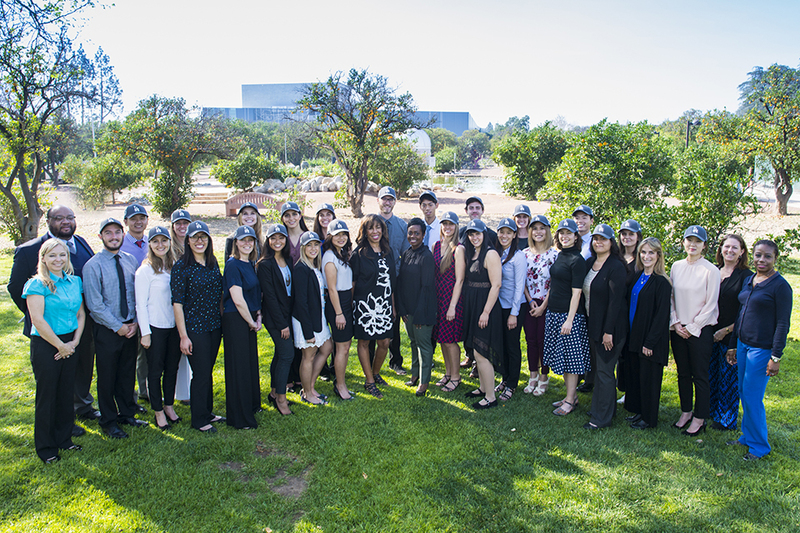 Today, the Roy and Roxie Campanella Foundation helps further that impact by providing 25 California State University, Northridge physical therapy (PT) students with scholarships for the renowned doctor of physical therapy (DPT) program. For the past 20 years, the CSUN Department of Physical Therapy has partnered with the Roy and Roxie Campanella Foundation to provide financial assistance to CSUN PT students. In 2009, the Los Angeles Dodgers Foundation joined forces with CSUN and the Campanella Foundation so the scholarships could continue. Each year, the scholarship cohort has grown, expanding to the present number of 25 scholars during the 2016-17 academic year. On Feb. 9, the diverse 2017-18 scholarship cohort, which is a good representation of CSUN’s many ethnicities and backgrounds, came together for a luncheon at the Orange Grove Bistro. The 25 students each shared words of gratitude directed toward members of the Los Angeles Dodgers Foundation and Joni Campanella-Roan — Roy and Roxie Campanella’s daughter — who represented her parents’ foundation. 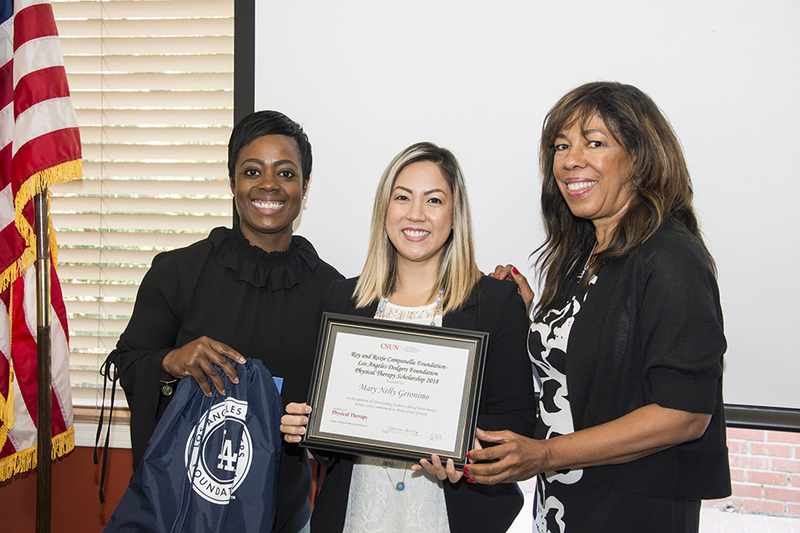 Nichol Whiteman, the Dodgers Foundation executive director, also attended the luncheon and, along with Campanella-Roan, presented scholarships to the students. “The definition of breaking barriers in this room is pretty priceless. There are students who are the first in many different ways,” Whiteman said. “Whether it be the first to obtain a graduate degree … the first to obtain a college degree or the first to get an education in this country. We have heard so many different ways in which this scholarship and this financial assistance is helping these students, but it’s way bigger than physical therapy. Aimee Kachingwe, a physical therapy faculty member who has seen this scholarship develop throughout the past two decades, said diversity in her field is invaluable. Four students showcase the diversity of CSUN’s DPT program. Seungeun Woo was born and raised in South Korea. At 20, she moved to the United States, learning a different language and immersing herself in a different culture. 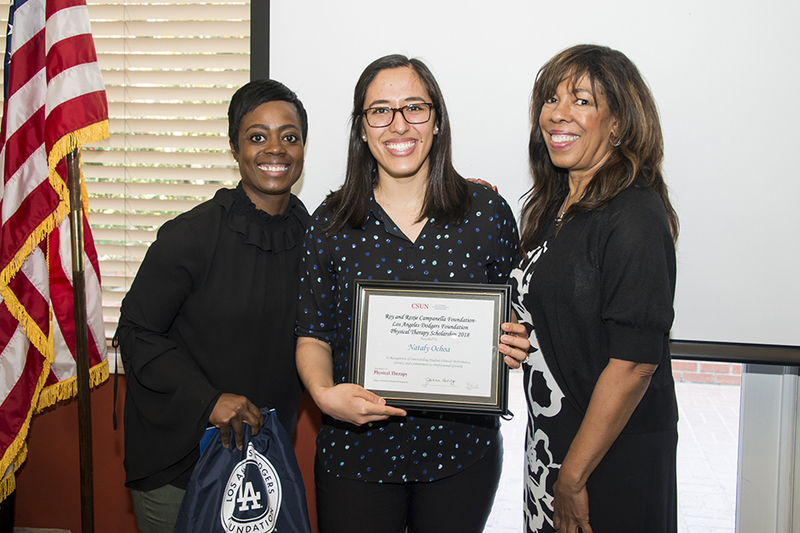 She is a third year in CSUN’s DPT program, and said that her experience has been more enriching than she ever could have imagined. With English as her second language, Woo said she needed to dedicate more time and effort to studying the material, so she was thrilled to find out her hard work had paid off. Nelly Geronimo applied for the scholarship twice before receiving it during her third year of the DPT program. As the first member of her family to pursue an advanced degree, Geronimo realized that graduate school funding opportunities are few and far between. Geronimo is of Guamanian descent and said that she “fits right in” to the celebration of diversity of the Campanella/Dodgers Scholarship group. Antonio Hanlin Feng is the only international student currently in enrolled in the DPT program. As a student from China, Feng said that “studying and living in another country has been challenging culturally and financially” because he’s far away from from family and paying a higher tuition. Feng has been very involved in extracurricular activities such as volunteering for visiting Japanese students from Jikei University in Tokyo and working with the Exercise Community Living in Prosthetics and Supporting Everyone (ECLIPSE) symposium, a group whose aim is to bring clinicians and people with limb loss together for education and support. Receiving this scholarship was more than just financial help for Feng. Nataly Ochoa is in her second semester of the DPT program. A first-generation San Fernando Valley native, she realized that few people in her community of Sun Valley knew what physical therapy was, and even fewer had access to it. Ochoa’s goal is to eradicate barriers that Latino communities face when seeking physical therapy. As a Spanish-speaking physical therapist, she’d be able to overcome the cultural and language barriers. “It would be a great honor to be able to help that population,” Ochoa said.